On September 19, a musical special dedicated to the late Dolphy, King of Philippine Comedy, was held at SM Mall of Asia Arena in Pasay City. 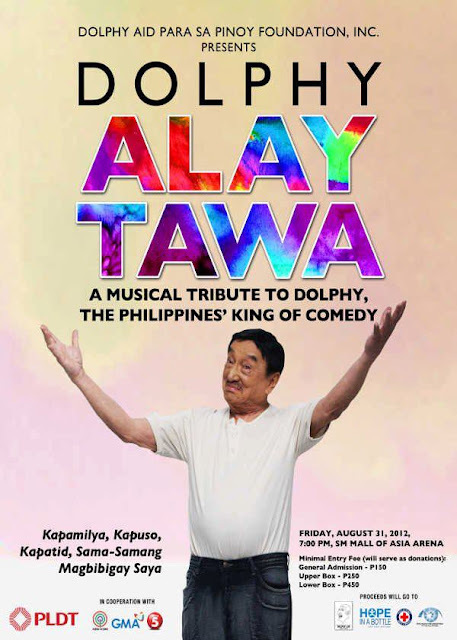 The special, titled Dolphy Alay Tawa: A Musical Tribute to the King of Philippine Comedy, celebrated the life and times of the showbiz luminary. 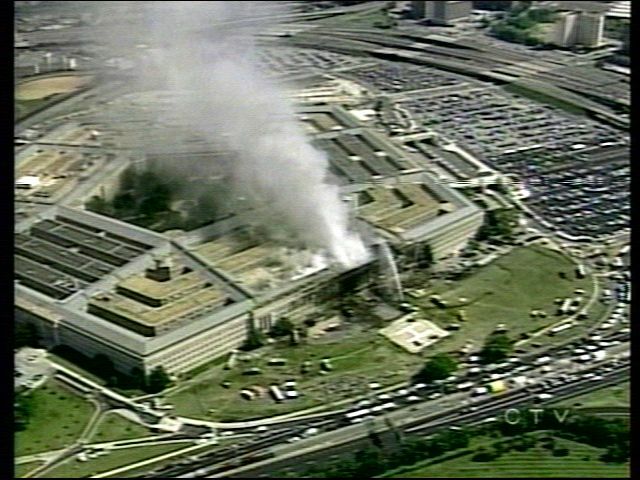 It was originally scheduled on August 31. One of the most common modes of transportation in the Philippines is the bus. To ride one, you have to go to the terminal or wait at the bus stop. Inside the bus, the conductor will ask the passenger about the destination. 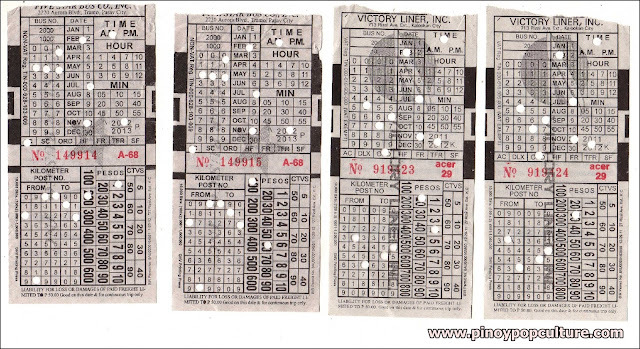 Using a puncher, perforations will be made on numbers appearing on the ticket. These numbers correspond to the Kilometer Post Numbers of the locations where the passenger rode and will take off. 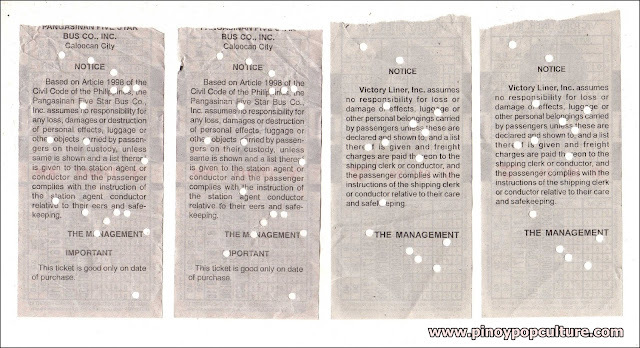 Perforations will also be made on numbers corresponding to the fare amount. Oftentimes, Bus No. and dates have been punched in advance by the conductor. "Based on Article 1998 of the Civil Code of the Philippines, the Pangasinan Five Star Bus Co., Inc. assumes no responsibility for any loss, damages or destruction of personal effects, luggage or other objects carried by passengers on their custody unless same is shown and a list thereof is given to the station agent or conductor and the passenger complies with the instruction of the station agent conductor relative to their eers [sic] and safekeeping." "Victory Liner, Inc. assumes no reponsibility for loss or damage of effects, luggage or other personal belongings carried by passengers unless these are declared and shown to, and a list thereof is given and freight charges are paid thereon to the shipping clerk or conductor, and the passenger complies with the instructions of the shipping clerk or conductor relative to their care and safekeeping." 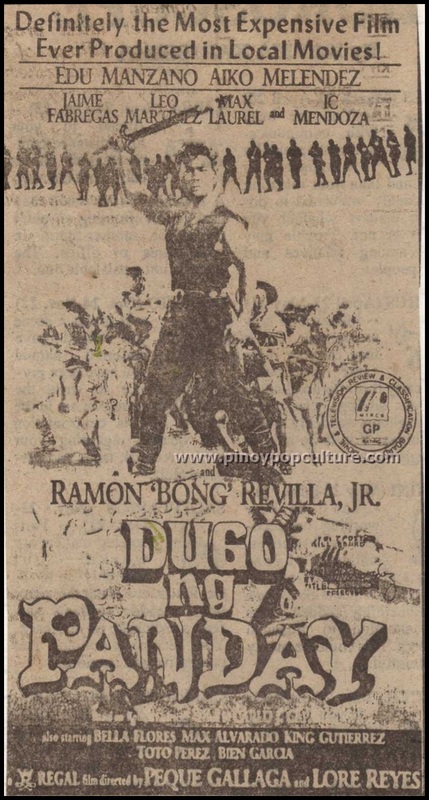 More than a week after the 1992 Metro Manila Film Festival, Regal Films released Dugo ng Panday, the initial offering of the production company for 1993. Under the direction of Peque Gallaga and Lore Reyes, The film is based on the famous komiks character created by Carlo J. Caparas. In the original komiks, Flavio is a blacksmith who forged a meteorite into a magical sword which he used in fighting the minions of Lizardo. Fernando Poe, Jr. portrayed the role of Flavio in a four-movie series that was released from 1980 to 1984. Max Alvarado played the villain Lizardo. 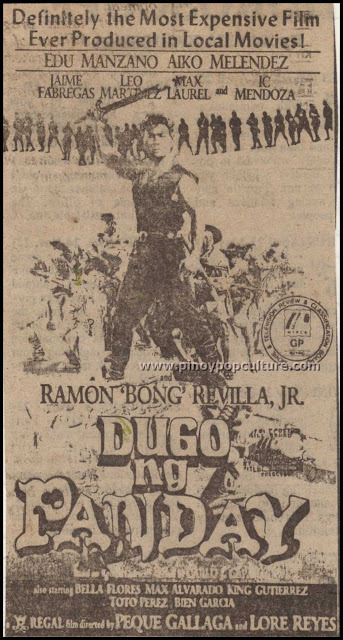 In the 1993 film, released January 4 that year, Ramon "Bong" Revilla, Jr. stars as a descendant and namesake of Flavio. He inherits the sword from the original blacksmith. Edu Manzano plays the cyborg controlled by Lizardo. Other members of the cast include Aiko Melendez, Jaime Fabregas, Leo Martinez, Max Laurel, and IC Mendoza. We have a chico tree in our backyard providing us a steady supply of the sweet brown fruit during the third quarter of the year. Scientifically known as Achras zapota or Manilkara zapota, chico is also called sapodilla. An evergreen native to Central America, the Caribbean, and Mexico, chico probably reached Philippine shores during the Manila-Acapulco galleon trade from 1565 to 1815. 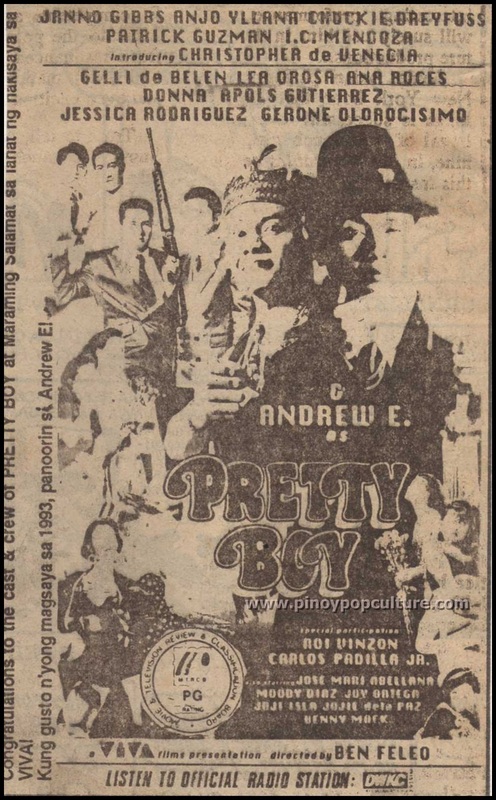 On January 4, 1993, more than a week after the 1992 Metro Manila Film Festival, the comedy film Pretty Boy opened in theaters. Pretty Boy was Viva Films' opening salvo for 1993. It stars the rap singer Andrew E. Other cast members include Janno Gibbs, Anjo Yllana, Chuckie Dreyfuss, Patrick Guzman, I.C. Mendoza, Gelli de Belen, Lea Orosa, Ana Roces, Donna Apols Gutierrez, Jessica Rodriguez, and Gerone Olorocisimo. Interestingly the film also introduces Christopher de Venecia, who is the youngest son of then-Pangasinan Congressman Jose de Venecia. The elder De Venecia was also House Speaker during that time. I was browsing through my collection, when I chanced upon pictures of a trip to SM Mall of Asia in May this year. The mall was opened by developer SM Prime Holdings in 2006. It is said to attract a daily average foot traffic of about 200,000 people. Having a land area of 42 hectares and a gross floor area of about 390,193 square metres, SM Mall of Asia is the second largest mall in the Philippines after SM City North EDSA. Being located in the Bay City reclamation area in Pasay City, the mall offers glimpses of the Manila Bay. Lito Lapid as Julio Valiente in "San Basilio"
San Basilio is a 1981 Filipino action film directed by Joey del Rosario and Tony Cruz. Featuring the masked folk hero Julio Valiente, the film stars Lito Lapid, a farmer and altar boy who assumes the role of Valiente to save the town from the clutches of the evil landlord Señor Escobar. Produced by Lapid's LL Productions, the film exemplifies other Filipino actors' venture into movie production. Tonight at 11:00 p.m., ABS-CBN will air the documentary "Johnny: The Juan Ponce Enrile Story" as its Sunday's Best presentation. The documentary will tackle the Senate President's life and career in the government, which has spanned almost five decades. Aside from a witness and participant in many events that shaped the Philippine nation, Enrile has also gained a considerable number of detractors and admirers alike. The country has just commemorated the fortieth anniversary of martial law, so the documentary is expected to highlight his role as martial law administrator. 150 Corporate Center, a building located along a portion of Panay Avenue, between EDSA and Sgt. Esguerra Ave., was featured in a recent episode of the ABS-CBN drama series Kahit Puso'y Masugatan. Labels: 150 Corporate Center, ABS-CBN, Andi Eigenmann, buildings, EDSA, ELJ Building, Jake Cuenca, Kahit Puso'y Masugatan, Panay Avenue, Sgt. Esguerra Ave.
Two days ago on September 19, Senate President Juan Ponce Enrile and Senator Antonio Trillanes IV clashed over a bill aimed at dividing the province of Camarines Sur. Enrile then started to attempted to expose the role of Trillanes as special envoy of the Philippines in the Scarborough Shoal dispute with China, but the latter walked out of the Senate floor. Instead of delving into the word war between these honorable men - the oldest and the youngest in the Senate - I will share a few snippets I learned from their resumes. Forty years ago today, President Ferdinand E. Marcos declared martial law in the Philippines by virtue of Proclamation No. 1081. At that time, Marcos had been in power as Philippine president since 1965. 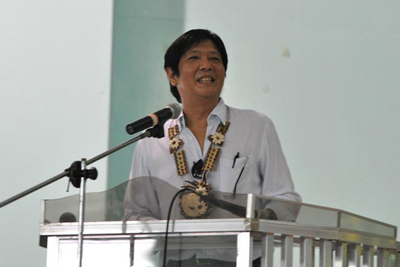 Marcos appeared on live television broadcast on September 23, 1972 to announce that proclamation had took effect. 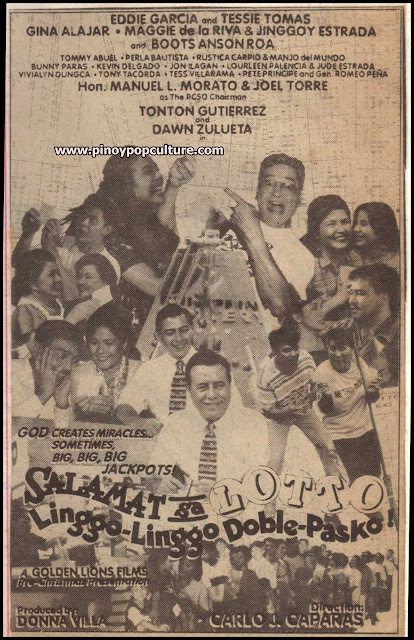 Golden Lions Films' 1995 pre-Christmas presentation, Salamat sa Lotto, Linggo-Linggo Doble-Pasko!, was released in theaters on November 30 that year. The husband-and-wife tandem of Donna Villa and Carlo J. Caparas produced and directed this production. 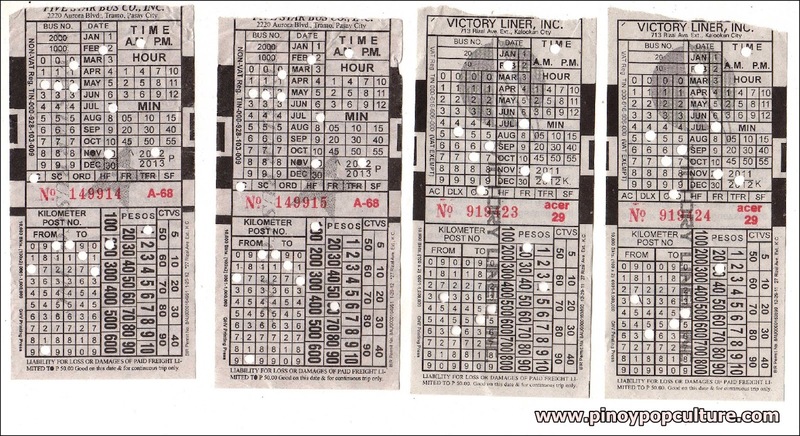 Salamat sa Lotto, Linggo-Linggo Doble-Pasko! (Thanks to Lotto, Every Week It's Double-Christmas!) promotes the Philippine Charity Sweepstakes Office's (PCSO) original Lotto 6/42 lottery game. It features how ordinary persons' lives were changed by the windfall brought about by their wins in the lottery. EZ2 Lotto, Suertres Lotto, Mega Lotto 6/45, Super Lotto 6/49, and Grand Lotto 6/55 are among the variants of the number lottery game that have been added to the original game. The ensemble cast of the film is led by Eddie Garcia, Tessie Tomas, Gina Alajar, Maggie de la Riva, Jinggoy Estrada, Boots Anson-Roa, Tonton Gutierrez, and Dawn Zulueta. 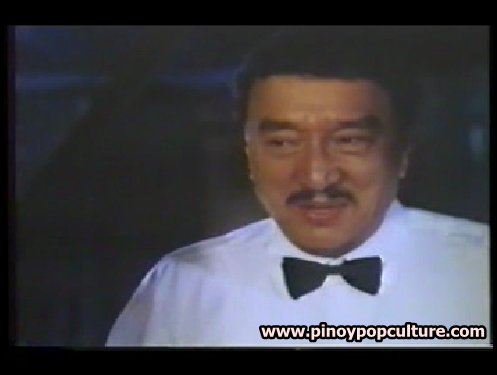 Joel Torre portrays the role of then-PCSO Chairman Manuel L. Morato, who also appears in the film. Tonight at 9:00 p.m., the winning combinations for the 6/42 and 6/49 games will be drawn. If you are at least 18 years of age, you might want to take your pick at the nearest betting station before 8:00 p.m., the cutoff time for betting. Who knows? You might be lucky enough to experience the "double Christmas." Like many other Filipinos, I prefer having dessert after a hearty meal. Dessert may be as simple as a piece of candy or as grand as a large serving of Black Forest cake. A few nights ago I tried a weird dessert combination that fortunately tasted just fine to me. It comprises atis (sugar-apple or sweetsop) fruit, minatamis na kamoteng kahoy (boiled and sweetened cassava), and saging (banana). Atis, scientifically known as Annona squamosa, is a small tree having a round fruit that looks resembles a pine cone. The sweet flesh of the fruit comes in segments, each having a black seed. 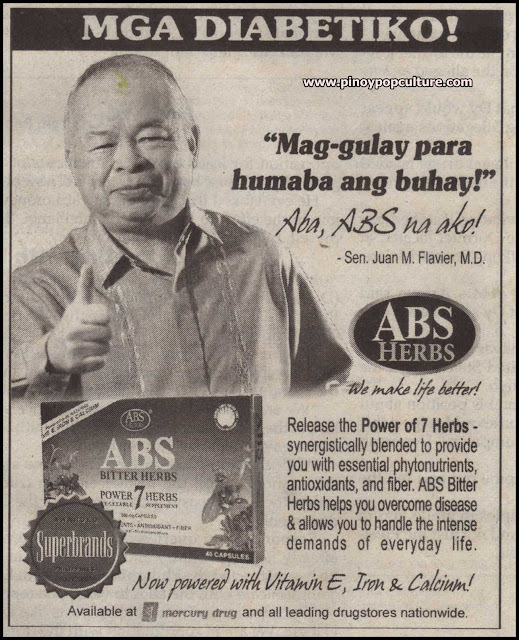 The popularity of Juan Flavier as Secretary of the Department of Health in the early 1990s seems to have propelled him to the Senate, serving for two consecutive six-year terms from 1995 to 2007. After his stint in politics, Flavier became active in various health advocacy programs. In November 2005, the Bangko Sentral ng Pilipinas erroneously circulated 100-peso bank notes that misspelled the surname of then-President Gloria Macapagal-Arroyo from "Arroyo" to "Arrovo." The bank notes, promptly pulled out of circulation, were said to have become collectors' items. Unfortunately, no such banknote landed on my hands. Filipinos are known for their inherent thriftiness. Any resource they have, whether food, money or the like, is used in the most efficient manner possible. In terms of money, they save their extra coins in their coin banks in line with the old Tagalog proverb, "Kung may isinuksok, may madudukot." This proverb expresses that when an expenditure arises, the accumulated savings can be readily used. In a trip to Zoobic Safari in Subic, Zambales last May, I purchased a bamboo coin bank handcrafted and sold by our Aeta friends there. This coin bank is my repository for 10-peso coins. In the Philippines, the sari-sari (Tagalog for "variety") store is an avenue for economic and social activity. Aside from allowing customers to buy items by piece or by small portions (e.g. half a liter of cooking oil), the sari-sari store credit purchases. Store owners can make a list of outstanding balances, and payments can be made depending on the agreement between owner and customer. Friends and neighbors can stay outside the store and talk about topics, ranging from the most inane to the most relevant, during business hours. Sari-sari stores also function as makeshift drinking bars. If a brawl ensues due to excessive drunkenness, the help of barangay patrols or policemen is necessary. The sari-sari store and the people inside and around it have been depicted in Filipino popular culture countless times. 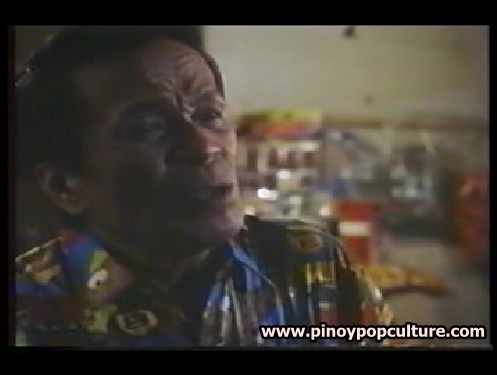 In the universe of the sitcom Home Along Da Riles, Mang Tomas is the sari-sari store owner to whom Kevin Kosme depends on. 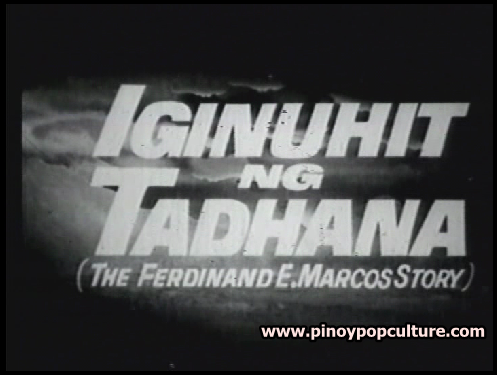 Young Bongbong Marcos' Speech in "Iginuhit ng Tadhana: The Ferdinand Marcos Story"
Two days ago, a post tackled Iginuhit ng Tadhana, the 1965 biographical film about former President Ferdinand E. Marcos. 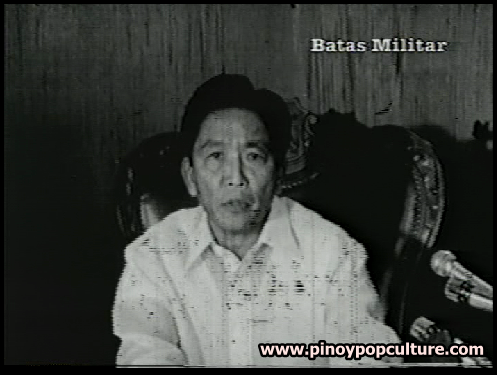 It also features the young Ferdinand Marcos, Jr., popularly known as "Bongbong." A scene highlights the young Bongbong's inclination towards politics by imitating his father in delivering a speech. Today, the now-Senator Ferdinand Marcos, Jr., is celebrating his fifty-fifth birthday. Whenever people ask me if I like vegetables, I tell them "any vegetable, except alugbati." 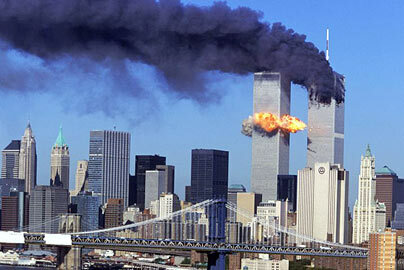 A big question mark then appears on their faces. 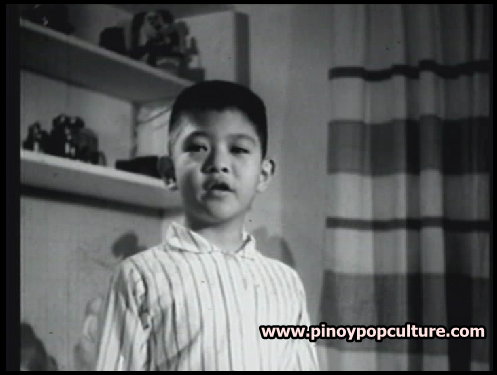 Luis Gonzales in "Iginuhit ng Tadhana: The Ferdinand E. Marcos Story"
In commemoration of the ninety-fifth anniversary of the birth of former President Ferdinand E. Marcos, I'll be sharing some screen captures from the 1965 biographical film Iginuhit ng Tadhana (translated as 'Destined by Fate'). The film stars Luis Gonzales in the title role and Gloria Romero as Imelda Romualdez-Marcos. Mia Rosa is featured in this film as Doña Josefa, Ferdinand's mother. Ferdinand Marcos, Jr. is cast as himself, while Vilma Santos and Chona portray Imee Marcos and Irene Marcos, respectively. Iginuhit ng Tadhana is a Sampaguita Pictures presentation of a 777 Films production. Three directors collaborated in making this film: Conrado Conde, Jose De Villa, and Mar S. Torres. Filipinos should also not forget that Ferdinand E. Marcos, the tenth President of the Republic of the Philippines was born on this date in 1917. 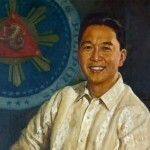 Marcos was President from December 30, 1965 to February 25, 1986. He would have been 95 years old if he were alive today. On September 21, our country will commemorate the fortieth anniversary of Marcos' declaration of martial law. The 1,000-peso bill is the currently circulating denomination of the New Generation Banknote Series of the Philippine peso released in December 2010. Obverse sides of both versions feature the World War II heroes Josefa Llanes Escoda, Jose Abad Santos, and Vicente Lim. 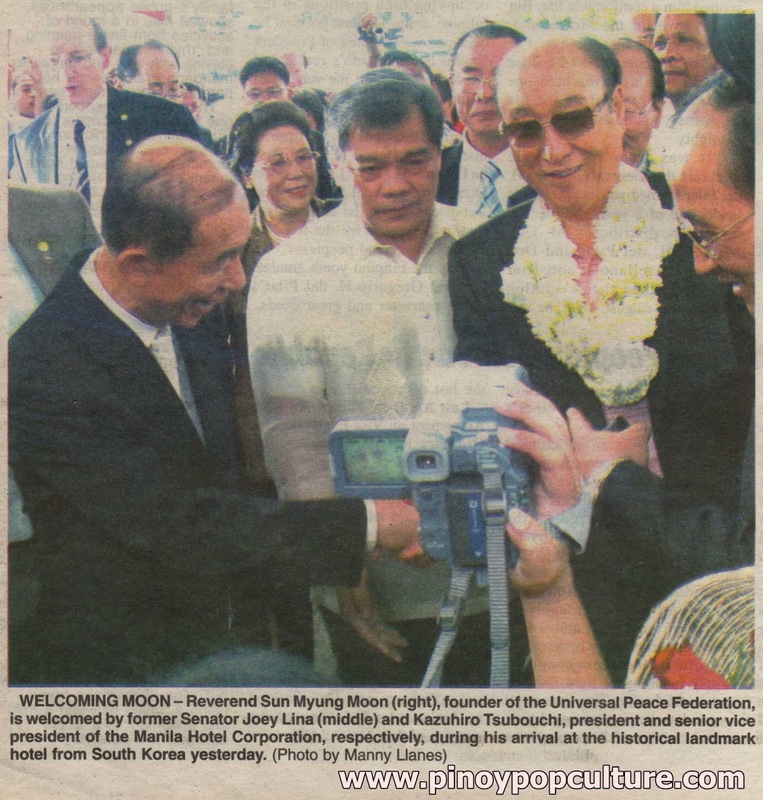 Korean religious leader Sun Myung Moon, founder of the Holy Spirit Association for the Unification of World Christianity, also called the Unification Church, died yesterday, September 3 at the age of 92. Moon's Unification Church is known for officiating mass weddings or marriage re-dedication ceremonies, which sometimes includes thousands of participants.